The last 40 years in Tucson, tell only part of the story of Maddock Machinery. 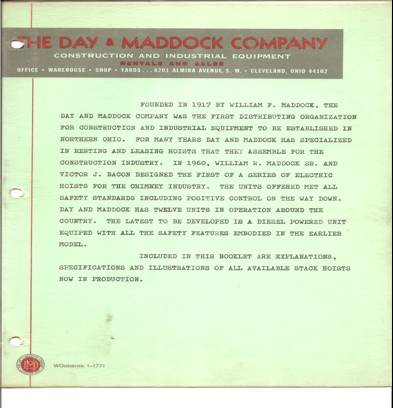 The Maddock family has a long history in heavy equipment dating back almost a full century to the founding of the Day & Maddock Corporation in Cleveland, Ohio in 1917. The company was founded as a leasing and distribution fleet for Northern Ohio construction contractors. Within a few years they boasted a diverse fleet consisting of construction equipment numbering in the thousands and were distributing and maintaining Maddock equipment to clients around the United States. Roads, power-plants, and buildings around the country were built using Maddock machinery. 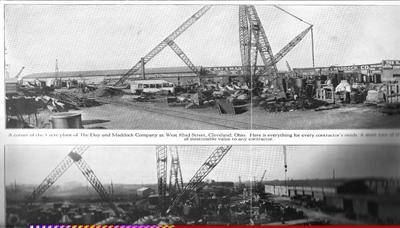 Founded in 1917 by William F. Maddock, The Day & Maddock Company was the first distributing organization for construction and industrial equipment to be established in Northern Ohio. For many years Day & Maddock has specialized in renting and leasing hoists that they assemble for the construction industry. In 1960 William R. Maddock Sr. and Victor J. Bacon designed the first of a series of electric hoists for the chimney industry. The units offered met all safety standards including positive control on the way down. Day & Maddock has twelve units in operation around the country. The Maddock Family’s passion for machinery and aerial equipment is entering its fifth generation of pride and quality. We are a proud family owned and operated business with a long history of providing professional grade solutions to industrial size problems.